"Great business tool to connect with"
"My Got to Go To"
The best things about Gotomeeting is that it is easy to use, it is striking and very entertaining and its costs are within the reach of any company. I feel very good using GoToMeeting, I use this tool in my work almost daily, very easy to create meetings, I feel very comfortable using it. You can share the screen, let someone else share it and even take control of another user's screen to solve problems or give assistance. Sometimes I can not listen to the other person although I see it online, the meeting is stuck. As an Internet-based tool, it's as good as your connection. The quality of audio and video can suffer significantly with very slow connections, so it is good to have a good provider. You have the possibility to start using Gotomeetings and try it with the free plan and then update it. Gotomeeting is one of the easiest videoconferencing services to use and it helps a lot in interdepartmental communication. Thanks to Gotomeeting we have been able to make progress in the work of the team, in addition to increasing communications between the different departments. It is very practical and easy to use, which facilitates the use of this tool for any of our workers, thus encouraging motivation to work. GTM works well most of the time. I like to organize my meetings with this tool because I can share the screen and choose if the participants can interact or not with my presentation. In addition, GTM is a tool that many professionals know and manage, which makes it easier to integrate them into meetings. I do not like to have to update the software constantly, but I understand that it is necessary to maintain good functioning. It may not be the cheapest option, but it is the best one. If what you are looking for is to look professional, and have meetings without interruptions or failures, I recommend you start using GTM. We have multiple locations and GTM helps us to shorten the distances, especially several points of view are required to make a decision. It is very simple to start a meeting at GTM to speak as if we were all in the same office. "The best conference program for your business"
The amount of time and expenses that makes me save, with our online meetings, change our way of doing business, your system is very simple and easy to use following the instructions, gives us security and video conferences are high definition. Without a doubt a breakthrough for my business. I do not find contras to this tool the only thing that has done is improve my company, communicate with another person who are in different places and see them up close, it is a very big advantage, record the meeting, until a transcript and everything is detailed , I can not host something negative. If I recommend to all those who wish to expand the communication of their business, its price is acceptable, it is based on the cloud, and technical support is of great help, and it gives me the possibility to show our products in real time and make the questions and are answered easily, what a pleasant experience. Gootmeting has been of great benefit to my organization, the individual mode where the video appears only one person and a group sees it, it is a meeting that you do not need to take note because this application transcribes it, there are also interactive meetings, the presenter controls who speak, and record all this is the best. "Great option to connect and communicate with GotoMeeting software"
After couple years of using GotoMeeting software, I definitely will continue using it since it's absolutely a great online meeting platform. The audio and video sharing are flawless; plus, it's very easy to swap between slide and presenter. GotoMeeting is a trouble free remote meeting technology with video feature and without needing a phone number. I'm satisfied with this feature. Personally, I save a lot of time and money for the company for not traveling around and worry that people not showing up for the meeting. It's completely easy to navigate and understand how to use it quickly and less paperwork involved. I believe that our company is gaining more clients from different countries after we are using this Gotomeeting software because it's a great way to interact with clients while we can still being very professional and saving a lot of conference cost and traveling cost. I can start a meeting with more than 40 people and Gotomeeting works great for our company without any interruption or issues. Every meeting went very well because sound quality was good and great visual screen. It's awesome meeting platform and you won't be disappointed when using it. I do recommend GoToMeeting for every company. - Anyone can attend meeting anytime and anywhere at no problem. - Professional Online meeting with clients and co-workers. "Good overall call quality with simple controls"
Both the audio and video quality of my usual GoToMeeting calls are clear with very little to no lag. Getting connected is very straightforward with simple instructions that just about anyone can follow. The platform is still secure enough to not allow just anyone to connect to our calls. The screen sharing feature comes in handy when we need to access something remotely or perform a task that the local user need to learn. The screen sharing is usually not too bad, but it doesn't' alway show remote desktops clearly. Some of the icons and such on the desktop might be unclear and have large blurry pixel elements in it. The text is sometimes even harder to read since it's smaller. GoToMeeting is a solid solution for online conference calls. The quality for both audio and video are usually good enough that your experience is similar to actually meeting in an office. It's a relatively cost-effective way to meet with people from distant geographic locations. GoToMeeting has served as a reliable audio and video conferencing hub where we can quickly and easily connect to people from within our company or with clients, outside associates and vendors. Since GoToMeeting is such a widely used group calling people platform, many people usually know how to access and use is without issue. It's a particularly good way to connect on group calls when we're working with new people and don't have time to set up a complicated calling system for everyone. "Good tool for booking online meeting with team on various locations"
The main advantage of GoToMeeting is that it is easy to join meetings for digital nomads since this platform has made it easy to create and join meetings for anyone sitting on various locations. The time to create and invite friends is easy and everyone can join to the group call in a matter of time ! The UI is also pretty simple and is easy to find the desired featured we are looking. The major issue I feel is the lack of proper support from the team of GoToMeeting, support is very bad and needs to be fixed asap. Please give more importance to the support team as there are the worst we have seen ! Our team members for a particular project are basically digital nomads so in order to have call with them we use GoToMeeting and we are more happy with the usage of this tool. "You need it to do business"
Here we use GoToMeeting almost every day of the week for the quality of audio and video it offers. I think GoToMeeting is a key piece in this business, because we have multiple locations in the country and communication is important for us. Moreover, with this software we cannot only listen to each other, but we can also see the body language of all those who are in the transmission. What I value a lot because it allows me to have a complete and sincere communication. There are times when we have "technical errors" (as we call them) when there is a delay in the transmission. Although I do not think, we should blame GoToMeeting because that is rather the responsibility of the Internet provider. I feel very comfortable using GoToMeeting as I said I use it in my work almost daily, of course, I recommend it. It has many uses here in the company. However, in my department, most of the time we use it to do interviews, train staff, attend conferences and communicate with each other. "Go ToMeeting has been our go-solution for video conferencing and effective communication." Has a very easy to use users interface thus easy to navigate and configure its simple features and functionality. It's easy to record a meeting. Has a native Apps for Mac's,Androids and PC'S. Has a great integration with Google calendar,Zapier and Chrome. It's easy to schedule a meeting,alert participants and add the meeting to our calender. Has a free trial version of 14days. Easy to make both audio and video calls by use of microphone and webcams respectively. This software's tends to take more bandwidth compared to its competitors because it has many robust features that requires excellent internet connection. It's a must use software for video conferencing and conducting online meetings effective thus they should consider giving it a trial. It's easy to carry out online meetings,training and presentations while using this software. Video conferencing make sure everything is brought under one roof. "Great Screen Sharing Bridge "
I really like Go To Meeting because of it's simplistic User Interface. I am able to send customers the link or dial in right away with no issues and have a clear and non lagging picture when I do share my screen. We use this tool at work almost daily and I cannot do my job without it. The Picture comes in super clear and I usually have no issues with it beforehand. Customers do not complain about the product like another one of our tools we use. I don't have too much to complain about, I also have another Web Bridge that my company uses called BlueJeans, but I do like Go To Meeting a lot more. It's more simple, and the link is easy to download for the customers. I think one critique I can give is that sometimes the call does drop, it might be a network thing for me and when I work from home. I wish there was a way to just send someone the call in ID, but maybe I just don't know if that feature is available or not. I think they can update the product to be a little more "New Age" kind of looks like WebX. but I really don't care. I like that it's simple. We use Go To Meeting for a number of different reasons. We rely on Screen Shares to improve our customers ability to digest information our sales reps are trying to deliver. We provide Demos, deep dives, and customer audio calls so that we can gain more new business and have account reviews with our install base customers as well. "GoToMeeting is anything but difficult!" When it comes to GoToMeeting utilization, it is anything but difficult! It has quite instinctive control settings. You can also include GoToMeeting into your calendar and it will announce the upcoming events. Another great feature from this software is that it allows you to share your screen and switch the moderator if necessary, so it can be lead by several people. To be honest, I don't have any dislikes with this software. I have been using it for more than a year now and it has always work amazingly well, and I have not received any complains from the rest of my team or from the other participants. It is a strong platform that give users the chance to take part into a conference. It additionally gives a video capacity that all the participants that I have come into contact with really appreciate. I would recommend this product to any company with requirements for regular online meetings with people from different cities or countries. Great tool! It is substantially easier to use and less ungainly than a phone call. I have utilized this platform to be a participant and also to lead online classes and conferences with several associations. GoToMeeting is an extraordinary app that takes into account different support levels among meetings for video chat with different departments and even other enterprises. I really enjoy being able to set up a meeting, getting a link to copy and then being able to send that link out to my meeting invitees really easily. It's been great to use for work and when someone last minute says that they need a call in and can't make it in person, it is really easy for me to pull up the link. I honestly have not run into anything that I dislike. There was one time that the screen sharing was a bit laggy, but that was the only time it was not working. I would say definitely use it! Use the screen share feature and make sure everyone on your meetings are usuing it as well. It is so helpful for remote people to see the work you are doing and to be able to train them or help them understand what is going on by sharing your screen with them. I would also say to send out meetings ahead of time. The instructions to use it are really easy to follow. We are able to share screens across our organization that is spread out across the United States. That way, people can follow along with the slide decks in real time rather than us having to explain where we are in the slide deck. It is really convenient. "Perfect platform for a small group of people"
It works very well when there is more than one leader for the meeting, when they need to switch devices to show their own screens. It’s amazing and, in these cases, it never crashes and the transitions are very good. Also, the quality of the video is not just great, but it does have several capabilities to make it look the way you want it to look. GoToMeeting is a platform recommended for people who need to interact with co-workers, superiors or costumer online and wish to have a quick access to begin a meeting, as this is one of its main benefits. Especially recommended for developers, designers and professionals who work with software and want to show its work, because it has an option that will allow to share the screen to other participants. There are some people in my department, me included, who prefer to use this platform for meeting over others. In fact, most of our Directors and supervisor use this because it is more suitable for meetings with a small group of people. I consider this a trustworthy tool for communication, rather if it is by video, call or chat. It is easy to get multiple, remote people together in one place to converse. I like that you can see who is talking, who is connected, and files or text can be shared as opposed to conference calls where none of that is possible or as easy. The only thing I dislike isn’t the fault of the software - those who have only called in and don’t have a screen in front of them don’t have all of the capabilities, but that is a user caused disadvantage. Best product I’ve found as far as ease of you and number of features and capabilities. For my business, we have multiple parties in all different geographical areas involved in one transaction - if anyone drops the ball on communication, it can really affect the entire deal. This way, if we all need to talk, we can easily coordinate and connect while also sharing documents in real time so we can see what is being discussed. I love the fact that it comes with a trial version, something some platforms nowadays don’t include, but in GoToMeeting they let you test the product first, and it worth it because is a very good one. Getting into this platform is very easy and fast, as simple as clicking on the link from the meeting and it will automatically generate the ID. Also, It is not necessary to download any software, because it can be used via browser, connecting to the meeting almost instantly. Often, I found myself having lags between the audio and the screen with no particular reason, it just happens regularly. Also, it does not have any way to see upcoming events. It would be nice if they could add some schedule on a board, like when you check on social media, to be aware of those events. Although there are a lot of people out there who prefer other conference platforms, like Zoom, I choose GoToMeeting because I find it easier to use, to access and with a great quality. Perfect if you are going to work with no more than 16 persons, if there are more, it might be tricky and get some video issues. I am a regular user of GoToMeeting. andI have used it from both sizes, by being a participant and a leader creating a meeting with several people, and I can tell it’s a great platform from both perspectives. Personally, I prefer this over other video chat platforms, because it is more user-friendly and runs fast with a good connection. "Easy to use anywhere you are"
"my working experience with Gotomeeting"
What I like most about utilizing GoToMeeting is the convenience and accessibility. Not exclusively is GoToMeeting simple to use as a moderator or chief, it is anything but difficult to use as a participant. The way that you don't need to down load an entire program to utilize it is certainly an or more. It is presumably its best piece. The other thing that is best is that it doesnt must be costly. While my comprehension is there can be a charge, every one of the occasions that I have utilized it, its been the free form, and I am satisfied with that. What I despise the most is that not every person has it immediately. I think the hardest part with utilizing it is when clients are first time clients. I surmise I can see it sort of being mistaking for new clients or the individuals who are not well informed. I recommend utilizing GoToMeetings for your next online course. It's anything but difficult to use for all gatherings of people! 4. What business issues would you say you are settling with the item? What benefits have you understood? I think GoToMeetings have settled the capacity to meet with, and give screen sharing and preparing in such a snappy and simple way. A portion of the advantages that I have seen is the capacity to take courses online all the more frequently, since a considerable lot of the organizations give or use GoToMeeting as a source to hold online classes. As a client, similar to I referenced, its simple and free. The straightforwardness for the participants of online courses makes for more online courses being offered, and the capacity to haul progressively out of online courses is extraordinary! "Quality Business conferencing with a reliable connection"
GoToMeeting has all the required features needed - Stable connecting, video (if you want it), ability to share screens, and pass off control of your screen. The last portion is a must have for our business, as we constantly need to take control of our customers screen to help them use our software. Since we've switched platforms, it's not as easy to get this functionality. Our customers also prefer GoToMeeting, as they find it the simplest User Interface to understand. The price tag for GoToMeeting is pretty steep. It doesn't make economical sense for our team to continue using GTM while other services offer most of the same functionality at a much lower price tag. Additionally, The Question/Comment functionality in GTM can often times confuse users and leads to questions being put into the comment section and vice-versa. It would be nice if the two were simply combined into one section to avoid confusion. It is worth the price if you want to use the best/most consistent meeting software, However the same features can mostly be found for a cheaper price by going with other companies. You get what you pay for in terms of quality with this product. GoToMeeting solves our businesses need to hold large meetings for an organization with employees across the globe. Additionally it allows us to schedule meetings with our clients at any time, which lets us provide trainings, consulting help, and maintain the overall health of our customers by providing training services to them. "Best Webinar platform to date"
I like everything about this platform. It is user-friendly. To operate you do not need extensive preparation. It does everything needed and provides a great way to attend and host webinars. I like how it automatically signs you in on mute. I have had and heard horror stories regarding that feature no being used. There is nothing I dislike, If i had to pick something I would choose that the graphics are plane and maybe there be a game mode option for those of us that are signed in early and waiting. Also, maybe a chat room that attendees can click into while they are waiting as well. I sign in early all the time to prepare for any issues ahead of time, so rewarding me with a room I can go into and play a game or read articles or preview the content we are covering ahead of time would be awesome. Webinars have increased my productivity. It allows me to attend educational teachings that would not have been an option for me, I enjoy that I can sign on from any device from anywhere and listen in to whatI need to. It has allowed me to go back to school and make being a mom and full time employee more manageable. Without these kind of platforms many of us working moms could not seek higher education and keep up with latest trends across the board in my profession that is ever evolving. "Extremely Intuitive Remote Video Conference Calling"
The Outlook plug-in does not work on my computer. It may be an issue on my side. Absolutely consider this remote meeting tool if you're looking for a more customizable option that the majority of ones on the market, along with a friendly interface. We have a lot of advisors who are out of the office when we have our company-wide meetings. This provides them the ability to join the meeting via the GoTo app and be able to participate no matter where they are. I like the ability to record the meetings to view later or show someone who was not able to attend the meeting. Sometimes when in meetings face to face or virtually, some of the conversation gets in depth and as the person usually taking meeting notes I can miss some of the information I need to record. The first couple times I used GoToMeeting I had a hard time navigating between showing my screen and the faculty member I was meeting with showing her screen. We actually ended up having to disconnect several times and reconnect until we figured out how to share properly. I would recommend watching tutorial videos (there are some on youtube) and to do a mock meeting beforehand if you will be using GotoMeeting for a presentation or some sort. There are some databases I have to log into to access study data and add more data for other team members to see. When I initially started learning how to navigate all of these databases was a little hard especially when I was being coached through the process over the phone from a team member in another state. GoToMeeting allowed me to be able to view their screen as they logged into a database and see the steps and screens they go through to get to the information needed which made it a lot easier for me to navigate on my own. What I like most about using GoToMeeting is the ease of use and availability. Not only is GoToMeeting easy to use as a presenter or manager, it is easy to use as an attendee. The fact that you do not have to down load a whole program to use it is definitely a plus. It is probably the best part of it. The other thing that is best is that it doesnt have to be expensive. While my understanding is there can be a fee, all the times that I have used it, its been the free version, and I am ok with that. What I dislike the most is that not everyone has it right away. I think the hardest part with using it is when users are first time users. I guess I can see it kind of being confusing for new users or those who are not tech savvy. I suggest using GoToMeetings for your next webinar. It's easy to use for all audiences! I think GoToMeetings have solved the ability to meet with, and provide screen sharing and training in such a quick and easy way. Some of the benefits that I have seen is the ability to take courses online more often, since many of the companies provide or use GoToMeeting as a source to hold webinars. As a user, like I mentioned, its easy and free. The ease for the attendees of webinars makes for more webinars being offered, and the ability to pull more out of webinars is great! "Go ToMeeting is the real deal for conducting and joining online meetings." With this software its easy to organize and attend online meetings,online trainings and demonstrations and video conferencing calls. This software eliminates the option of taking notes during a meeting because its easy to record a meeting sessions. Has a very easy to users interface. It's easy to chat using this software. The support from this software is great and any issue we had was answered in a minute call. This software been internet based its only as good as your connection so audio and video quality could suffer with slower connections. This is software that is very easy to use and setup thus implementation doesn't consume much time hence I recommend other organizations to deploy it. It's possible to conduct online board meetings. Easy to of free support to clients and employees having issues with their banks accounts. "Best and easy to set a online meeting!." Very Easy to use and hassle-free.i can share, send a file, chat and voice call, etc all features available. The best feature I like to use no need to install anything. But go to meeting need to update some feature like when we using the phone and go to another window call dropped. This is a big issue. they just need to update it.it provides more functionality than if I were just calling in on the phone line. If a connection is not good, it will give the option to switch to a phone line and works fine. Slow video when share screen.Also sometimes audio create issue. I would be recommended especially freelancer to use this. Easy to set a meeting with your client and share screen very smooth. Nt important just improve the share screen and remote aces bit faster. "GoTo Meeting: A go-to choice"
Go-to Meeting is an easy to use interface, with the ability to see who is logged in and who has control of the meeting. I like that the voice control shows the volume of who is speaking and when, and the screen sharing option usually does not have any glitches, which is NICE! The background interface of Go-To Meeting doesn't have a great app interface. It has an okay web-based background interface, but the app itself on my desktop has some issues if I needed to change any settings through that. Go-To Meeting is a great way to organize employees, projects, and meet with clients in a way that is dependable and professional. If you are between getting a program for meetings or trying to use other existing programs (i.e. Skype, FacebBook Chat, etc.) try out Go-To Meeting!! We do a lot of video conferences both just between remote employees and with clients in other towns. Go-To Meeting allows us to all be on the same page with goals and project expectations. Go-To Meeting also is a way to have dependable screen-sharing meetings with clients where we don't have a common issue with dropping calls or having issues with the video chats falling through. This meeting comes across much more professional in that way than a skype meeting that has these dropping issues. "Conference Calls / Web Meetings Anywyere"
I really love the ease of use and the fact that the mobile app works really well. I spend a lot of time on the road for business and I am always amazed at the quality and speed of the connection to meetings on my Android Phone. I wish the conference IDs/codes were shorter, but their new one-touch generated phone numbers and codes have greatly helped with this. Sometimes on the mobile app it is a little difficult to get bluetooth or wired audio connections correct, but that's not a major issue. I don't usually have any technical issues with GoTo Meeting, however sometimes participants do, I'm chalking that up to user error. A primary purpose of my role at the company is to act as a bridge between sales and IT between InDemand and our customers/potential customers. So I spend a lot of time on conference calls, it is important that calls are easy to create and are stable. "GoToMeeting = The best software for stay in touch with your peers/colleagues and clients/customers "
GoToMeeting is a web-hosted service that provides an online meeting, desktop sharing, and video conferencing software that enables the user to meet with other computer users, customers, clients or colleagues via the Internet in real time. I wish I had discovered it a while back! This software is phenomenal and surpasses others. If you are looking for a software that will enable you to stay in touch with clients and peers out of state or out of country, Go To Meeting is the perfect online and mobile tool to use! User friendly and truly covers all aspects of communications. Perfect for video conferencing. The desktop application allows me to access all of the great collaboration tools, including shared keyboard/mouse control, drawing tools, and multi-monitor screen sharing. the software offers mobile apps for iPad, iPhone and Android devices and is very easy to use. I meet with students often online, and go to meeting is where it's at. We can video, chat, and share screens do finish homework and have online lectures. I wouldn't recommend anything else. I can bring up assignments for my students, webpages, and files for them to see and work on. The chat let's us mute ourselves if we are in a place that is loud. The mute/unmute let's us talk face to face with the webcam. The connection isn't always great, but it is good to work with. Sometimes my students get kicked out, but it may be their internet as well. Make the connection a little better, I often get "You may be experiencing difficulty" error messages. Meeting with staff and students across the country. One benefit is getting everyone on the same page, we have staff in California all the way to Florida. "GoToMeeting - A handy tool that is easy to use"
It is great for adding a visual component to a call and it is very easy to use. When talking to someone on the phone and the need to share something pops up, I can have an impromptu GoToMeeting up and running in a couple of minutes. I have not run into any video conferencing need I could not fill with GoToMeeting.Working on a small device can be a little challenging. It is a good product that does its job well. Any time I need to add visuals into a remote conversation I use GoToMeeting. I have also used it to diagnose problems. For instance, a technically challenged customer was having trouble with our website. I was able to get a GoToMeeting running with them and, being able to see what they saw, it made solving the problem very easy. I have nothing bad to say about this software. They deliver exactly the performance that we as a company need to remote host and show sessions to other clients and perform our remote duties. If easy use is your mantra this is the tool for you. The sound and visual quality are always up to par and the installation in itself works with every device every browser. The scheduling assistant easily integrates with outlook and takes into regard in which timezone you are scheduling your remote meeting which is awesome. Support is always helpful and responds in the proper timely manner. We work a lot overseas, connecting in different timezones with often a lot of hassle to start up a remote session, goto meeting simplifies this for us. The scheduler inside go to meeting really helps with the differences in timezones because it connects to outlook in your timezone of choice so you never get discussions about the scheduled meeting time. For us, the quality and ease of use of the program are solving the 'boundaries' which often arise when introducing a new product to a group of people. "Best tool for meeting "
I like all the good features that are provided by GoToMeeting but the best thing I find is that I can record for the later time so if someone could not join can have it. It is truly best available in the market. Also the mobile app gives us more freedom to use this at wherever we go. There are not much thing that I dislike about GoToMeeting but I have felt a lag sometimes, but that could be also because of connection speed. Will keep this review updated if I dislike anything about it. I would highly recommend GoToMeeting to everyone since it is the best available till date for good quality video conferencing. There is also 15 day trial there , so I would say give it a try and if you find it good then go with it. In our organization our team use this platform to connect with client or other stakeholders directly at a click. We don't need to meet at specific location to share ideas like we used to do it before. This has helped a lot. "GoToMeeting by LogMeIn - A web meeting solution"
This is extremely very much planned programming for remote gatherings with sound, video, and screen sharing. I likewise love the friend item GoToWebinar that I've utilized for some online courses throughout the most recent quite a long while. GoToMeeting has increased such great selection that it has incorporations wherever with apparatuses like Google Calendar, Chrome, Zapier, and others. We utilized GoToMeeting for quite a long time for inward gatherings, deals calls- - essentially any gathering with remote participants.I like how you can make a constant connection that you can go to each time instead of setting up another connection for each gathering. Simply be cautious in case you're having consecutive gatherings with a similar connection - else, you get the following group of onlookers appearing at the last part of the present gathering. I tackled that by making two tireless connections and substituting them when I have consecutive gatherings. Needs propelled gathering choices, for example, polling. Tops video gatherings to six sessions. Video calls can't be recorded. GoToMeeting stays one of the simplest conferencing stages to utilize, and the video-meeting highlight keeps the application significant, particularly as new clients and items surge the market constantly. "When there's issues, it's very disruptive"
I do like that you have options to use either your phone or computer audio and that the presenter can get access to screen/mouse control. Once it's downloaded it's a pretty seamless log-in process. I do wish if the party was large GTM makes it more obvious stating who's speaking It's also odd that when you join a meeting you are defaulted as muted. It causes a lot of technology hiccups with a new user of GTM. I've also found that when the other party you are trying to connect with is having issues, it's difficult to troubleshoot. I also feel like the chat feature could use some improvement. The box it's defaulted to is very small and if there is a large amount of text going back and forth it is hard to follow. You can pop it out, but it's still not the most user-friendly. The one thing that would make it perfect is if there was an automated/easier way to record and share calls. I think a feature may be in beta right now so I am excited to try it out when it rolls out. Think about long term integrations with other tools you use (Calendly, TimeTrade, CRMs, etc.). If you are planning to use GTM as an internal communication tool (if you work remotely) I would take the time to test out other tools because I have a feeling there are some features that would weigh as more important. We need to have a seamless screen sharing experience with our clients. It's helpful to be able to record and share sessions so learning our product and adoption improves. It integrates nicely with Calendly so when a new meeting is booked by a client unique GTM log-in information is provided automatically. "GoToMeeting has made our team meetings so much better"
I like that when we do collaborative team meetings each of us can jump in and share data or talking points. In other programs the "leader" has to give permission to share the screen and there is a lot of lost time asking to share and then making sure the sharing is working. In GoToMeeting the administrator can grant access to share to all participants or only some beforehand. It is way more seamless. So far I haven't found anything that I dislike about GoToMeeting. We have been using it as a team for a couple months and haven't ran into anything. Using GoToMeetings has made our team meetings more seamless and convenient. My team is all remote and with GoToMeeting you can jump on a call on your phone and then transfer to your computer/ipad/other device. It's so easy that you never have to worry about missing a call. I know other team members use GoToMeeting to connect with clients. I don't because I am an assistant, but all of them have said that they love how easy this is to use with our clients. They like the feature that you can block entrance into the next meeting. This ensures people don't jump onto the end of a private meeting that went over the original allotted time. I use GoToMeeting to train new clients on our software and its the easiest and best way to train them! The ability to record the meetings and send to clients is amazing and super helpful! The video and audio qualities are always great! The only thing that needs to be problem solved is the fact that those on the receiving end who get our GoToMeeting links often times had issues whether it be because of confusion around how to use the dial in or what which option to choose., there may need to be an easier and more simplified way to share conference URLs. "GTM is good for some things"
GoToMeeting is pretty easy to use and its nice that you can add the Chrome extension from your google calendar. It doesn't always have great connection, a lot of times the sound drops for a period of time before it comes back. Also showing the video screen typically makes the connection worse, trying to watch another video over GTM is impossible as well. I think GTM is a solid product but I have heard there are much better tools for virtual meetings. Not sure how it compares price wise but I wouldn't make a significant investment in GTM. When we have company wide or larger recruiting meetings we tend to use GTM instead of Google Meet because it can hold more people. The amount of people that can join the call on GTM is the biggest benefit. "Great tool for large, remote trainings"
GoToMeeting lets us get trainings from our team in DC, with participants from around the country. There are opportunities to ask questions and engage the group, but we don't need to worry about lots of background noise or trying to get many web-cams connected. It's a great webinar tool. I wish that GoToMeeting gave you a clear estimation on how long it would take to download the software so you could plan ahead for your first webinar. I've had many teammates miss the first 10-15 minutes of a presentation because they were trying to get their download to work. This can be distracting. Plan ahead if you have techincally challenged participants to ensure that you can launch your meeting on time. When you have a large team around the country, you need a space where you can all come together and collaborate. GoToMeeting is a great tool to solve that issue. "Easy to schedule virtual meetings"
I had previously used WebEx at another company but my current company uses GoToMeeting. This is just as user friendly as WebEx was, so scheduling virtual meetings remains a breeze. I appreciate its versatility as I support 5 C-suite execs, so I am scheduling a lot of meetings! A couple of times we have experienced small glitches during the meeting/call. I'm unsure if this was due to the GoToMeeting software or some other factor which affected the call/meeting. Highly recommend this! Just as easy to use as WebEx or Zoom meeting and quality of calls/meetings is excellent. Very user friendly which is important to encourage company wide use. Our C-level execs travel quite alot and having them all in the office at once doesn't happen every day, so this product allows the necessary meetings which they need to attend (whether in person or virtually). What I like best is the ability to work with co-workers who are located in different offices. It has afforded the opportunity for all of our employees to be in 1 meeting at the same time. There is nothing that I dislike about this program. This product has changed the way that the workforce does business in that it brings people from all over together at the same time. "GoToMeeting has been the best meeting tool I have used"
There's quite a few ways to meet, do business, and connect no a days, but GoToMeeting is the easiest to setup, to integrate and to get others to use as well. The setup is minimal, easy to follow, and we have been able to connect with clients all over the world because of it. The screen sharing capabilities we use for every meeting to conduct business with clients and show them proofs, walk them through websites and more. We also have used our webcam to be able to show prototypes of products and samples for clients in other parts of the world. Sometimes their is a bit of lag, but that all depends on each persons connection, and it has never truly destroyed a meeting with anyone. A fantastic meeting tool! Would absolutely recommend this tool! International meetings easily, quickly, and efficiently. Not having to travel long distances for these types of meetings is key to our company and clients. If you search for a smooth meeting with high level of productivity and almost no confusion between attendees, so you must have GoToMeeting product, it is great in facilitating communication and points of view between attendees, conference calls, video calls and sharing the screen are really with a perfect quality and with a proven satisfaction from all attendees, sharing controls and presentation between attendees overcomes the long distances between attendees, the muting feature is great and the chatting is very light and very effective, everything is great from the second of scheduling the meeting and sharing it to the attendees calender till saving the recorded meeting to be uploaded very easily on Google Drive to be shared to all stakeholders for documentation purposes. 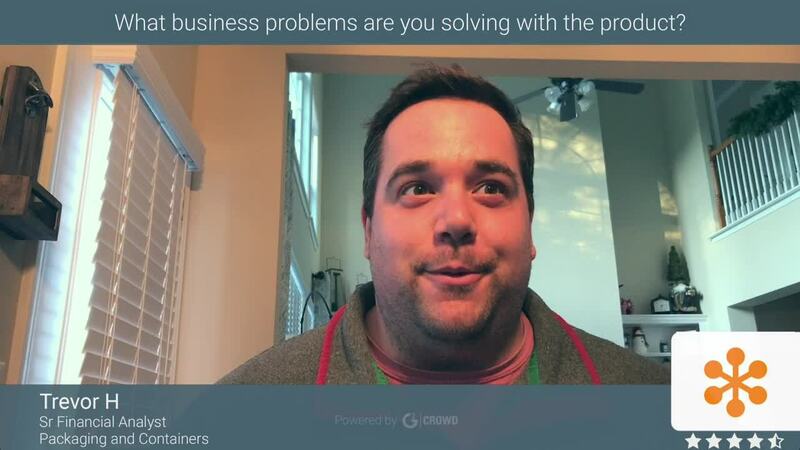 "Pretty good tool for enterprise meetings that require screen sharing." I like that it has integrations with other scheduling tools, like my Outlook calendar and Calendly scheduler. The meetings are easy to set up, and you can host a meeting at anytime at the click of a button, which is really convenient. As long as I've been using it, the service has been very reliable. It's also very easy to record sessions and share them. I wish there were more tools - like storing files in the meeting, whiteboards, surveys, and such. It's also a bit of a nuisance that you can't resize the meeting panel. The price can be a bit steep for single users that need to host. If you're an individual, small company, or startup, I would recommend trying other (more cost friendly) tools that are out there, especially if your webmeeting needs are as simple as video chat and screen sharing. I frequently communicate with end-users around the country, and in all different time zones. This tool has really allowed me to host my meetings whenever, wherever, and I know I can rely on it to work or not be too technically challenging for whoever is on the other end of the call. "Great way to be a part of a meeting and see what is going on from another state." I like being able to see what is happening during a meeting. We often have a speaker so it is nice to see their presentation and be able to interact while being out of state. Sometimes the video pauses or shuts down. This is usually more of a bandwidth issue, but it is frustrating when it happens. Great and simple way to have meetings when staff is offsite. You can share your screen and video to engage with attendees as well as show slides. We have great success with this tool and recommend it to anyone with out of town clients or staff. Being at meetings without having to spend the money to fly to the location. I can interact while on GoToMeeting as if I were there. "Gotomeeting is a very good meeting App"
The best is the illustration tools provided to facilitate the presenter message, as I can share my screen or make any attendee as a presenter, I can draw on my screen or highlight specific part to decrease confusion, I can use the chat to request something from attendees without interrupting the presenter, the number of allowed attendees in one meeting is more than enough, the quality of the sound and the video is very good, recording meetings also becomes essential for documentation purposes, host a meeting is very quick and sharing the invitation to others is very smart, the integration with Google calendar is perfect, the scheduling features helps us a lot and our meetings became more organized. Facilitates delivering the message of the presenter, increase the focus and concentration, eliminates interruptions, our company always use it to do all required meetings for KPIs, clients demos and training purposes, recording the meeting solves a lot of conflicts between team members and always release conflicts. 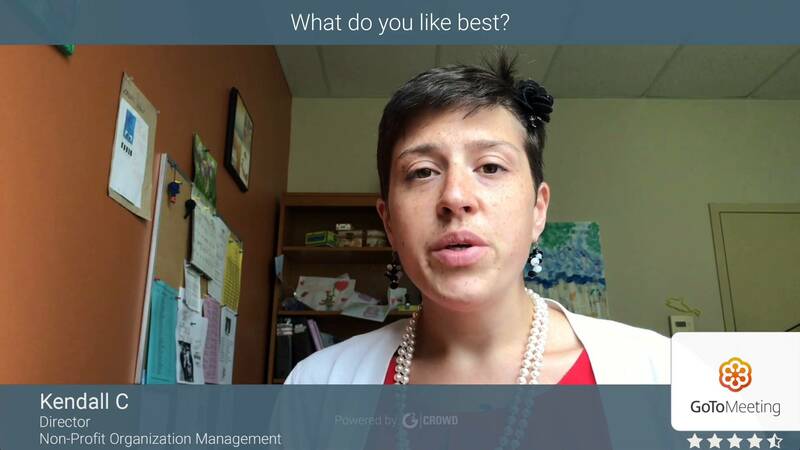 "A great way to connect without having to connect...."
I like that I am able to log in in real time and have a conference with several people all working on the same project nation wide. I also like the option to record for a later time or to share with those that were not able to connect at that time. I find it to be very user friendly and have noticed that there are several helpful tutorials as well. A big bonus for some of us! One of the least desirable issues that seems to happen a lot of the time is the video quality and the lag. Also a couple of crashing issues and busy signals when dialing in.. I also have a couple of cohorts that stated the recording function did not work with Mac. Just be patient it will prove to be a winner I believe. #1 business problem being solved is not having to get on an airplane every time there is an upcoming training or something that requires more of my attention and time than I really have to give. I find it to be efficient for the most part and I like that the audio doesn't require an actual phone. I know there is some scheduling assist that can be implemented but have not had the chance to use it yet, but am excited to try. some other benefits I have found is being able to share control of the meeting. Also instant collaboration with the screen share option. "Gotomeeting helps with best sound and video quality"
Gotomeeting aka GTM helps with sound and video quality with our client meetings. it provides best video resolution and great audio to our meeting participants. Gotomeeting also helps us recording the meetings which can be recorded on our computer drive. It also enables people top dial in using the Meeting ID which is provided for each and every meeting by Gotomeeting. I like GTM to make the meetings with the clients and the potential clients. I do not think there is anything which I do not like with Gotomeeting. It works great and as expected. Gotomeeting is a great software to do online meetings with anyone in the world. it helps with meetings just with use of a web browser over the internet. Provides a Meeting ID and an dial-in number to join the meetings by the meeting participants. GTM helps us with making the calls with our clients and potential clients. it helps us hear them and see their requirements. We also explain the work done for them using the Gotomeeting. It also helps to discuss the status of their products and the billing and invoice things. "Good potential and very helpful to videoconference and screenshare." GoToMeeting its the most useful app to videoconference, with a extremely easy mode to configure and use it. It counts with very practical interface to conrol it and start a meeting. Also you can get the app to mobile use and do the same action from your device. Im very familiar with the browser interface and just with share my meeting link, people can join to and start to interact with the people envolved. GTM its not avaible to use it on Linux which its one of the most likely OS to me. Also when your in an actual meeting you may need to share some files between, and there's another point to have in mind to this software. Not a strong reasons to think its a potential negative function, its a really helpfull service to have live comunication and more. Great control of webinar and videoconference tools, if you need to do screenshare to explain some work to clients, or just set a meeting to have comunication with your partners, family or friends, with the posibility to handle it from your pc, tablet or phone. Strong reasons to try it. The great benefit to have a effective comunication with all the partners envolved in a meeting. We have to have in mind that the posibility to share your screen live and with good quality to audio and video. I think its a tool to all your devices in his free and paid version as well. "GoToMeeting, comes from the future." GoToMeeting gives us the opportunity to hold conferences, debates, rains of group ideas, all in the same channel and the best: at a distance when some people from the team are in other countries. Many times we have meetings directly with clients, associates and colleagues in the same meeting, but with the help of the appropriate channel for each topic of conversation. GoToMeeting presents a new image to hold meetings, gives us the possibility of configuration and personalization so that, when we use it, we have that almost emotional relationship. GoToMeeting is coming to places in the market in an impressive way, still has basic features compared to some of its direct competitors, for example, the fact of sending me a document so you can copy and share it. Point to keep in mind for the next versions. In consideration of the product, GoToMeeting offers us the opportunity to be autonomous for the meeting, leaving aside all kinds of protocols and parameters that comply with the reluctance of effectiveness. For many years in the industry, it has been established that you must comply with a protocol so that the success of a meeting is tangible, nothing is further from the truth. With GoToMeeting there are no limits to success in conferences. GoToMeeting has guaranteed us that time is valuable when we meet, it is for them that we can connect from where we are, share ideas and reach an important shared agreement. He really compared his vision of the product and headed towards the co-direct direction. * We monitor all GoToMeeting reviews to prevent fraudulent reviews and keep review quality high. We do not post reviews by company employees or direct competitors. Validated reviews require the user to submit a screenshot of the product containing their user ID, in order to verify a user is an actual user of the product. Hi there! Are you looking to implement a solution like GoToMeeting?